Welcome! I make so many sympathy cards to sell in the shop that I thought it best to lump a few into one post. I had to have the Penny Black Botanical Notes stamp after seeing it on others' blogs, and found it makes a lovely background in gray. The sentiment is from my oft-used Hero Arts set, With Sympathy. I stamped the image twice on pale gray cardstock, and cut out one butterfly to place on top. I used a white shimmer Smooch ink to paint the butterfly, but I couldn't adequately capture that in a photo. The next card is one I've made many times over. It's a CASE of a card by Susan Raihala of Simplicity. She's got such a way with the clean and simple style. The last involves subtle sponging, and a stamping-off technique: stamp an image full-strength on scrap paper, then stamp on your card panel to get a softer appearance. 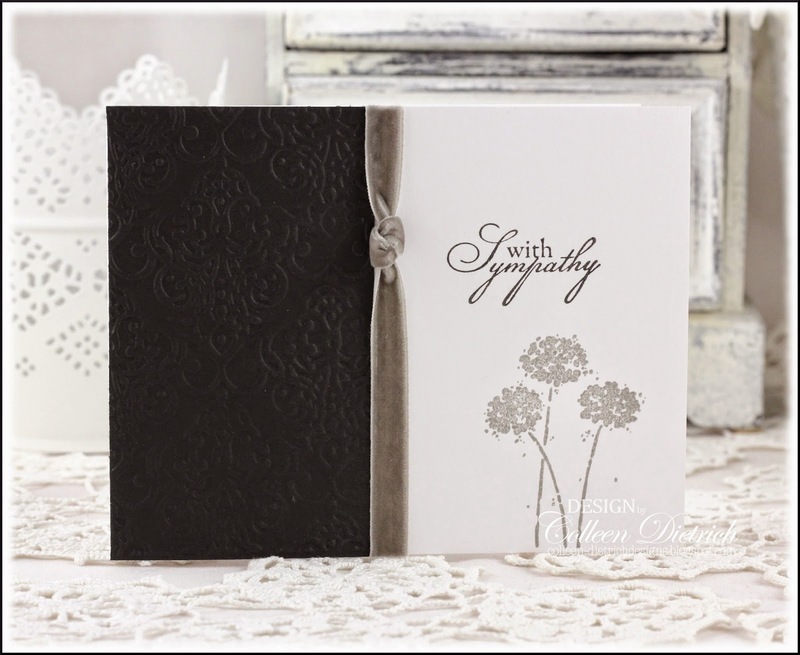 Gorgeous and elegant Sympathy cards. They always come in handy. OM Gosh Colleen, these are beautiful and so elegant. Love them all. Your color choices and the images are fab. Impressive. Hugz! I have the stamp you used on your first card and it amazes me the different looks any one stamp can have :-) These are so pretty Colleen!! Love all of them, Colleen! Although, I would never have thought of using violet/ purple for sympathy card but I love how yours turned out. 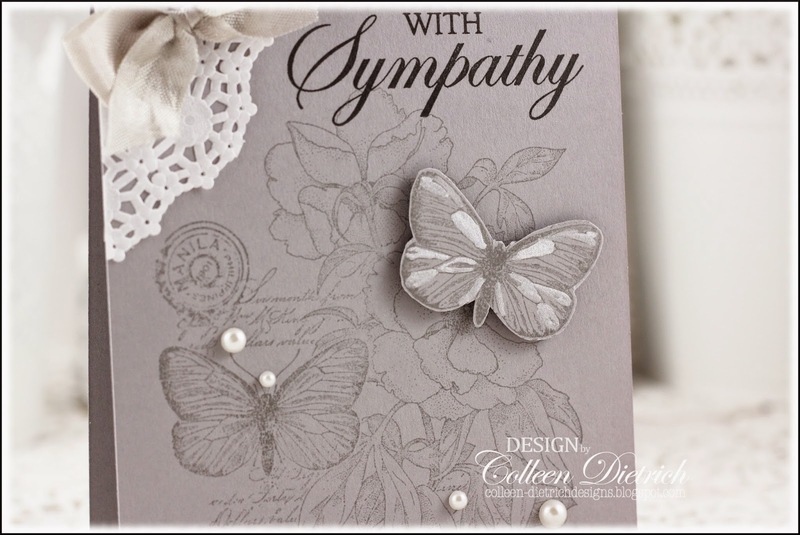 Sympathy cards are not easy to make. You did a fab job and these three cards are gorgeous. The first one is my favorite; subtle and elegant. It's so YOU and has your signature of elegance all over it. They will comfort the recipient for sure. That botanical stamp is on my list too! I LOVE what you've done with it in the gray! In fact all 3 of these cards are awesome! Beautiful cards - perfect color combos for the type. ADORE that first card, and that flower image on the second always a great one to use (love it). Way to rock the purple on the last one! 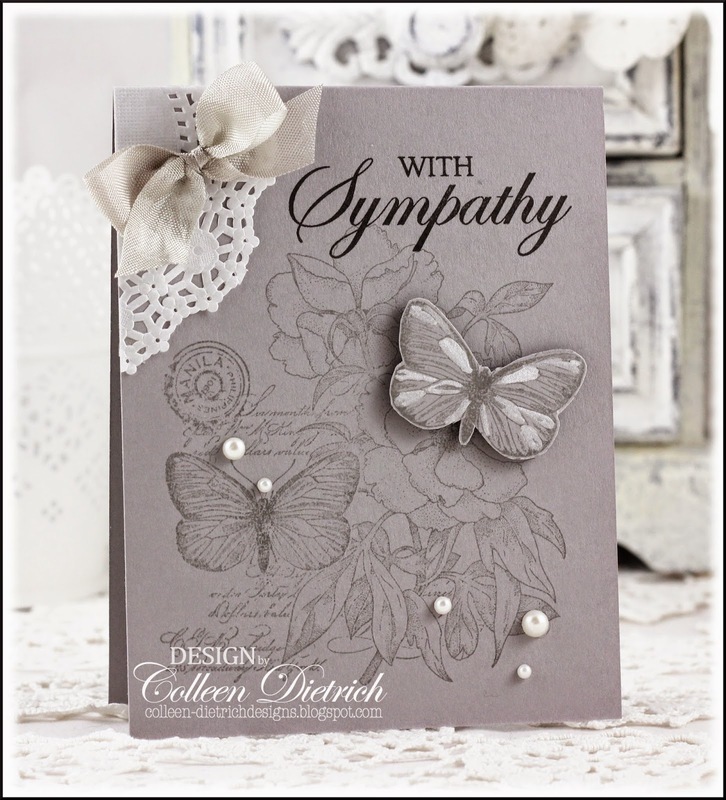 Beautiful sympathy cards Colleen, the colors are wonderful!! All so beautiful, Colleen! I predict you'll make your money back on that gorgeous PB stamp if you haven't already. I still have Happy Harmony but it's on my sentiment shelf, so not on the progression. That is a lovely card in the very dignified neutrals. Love the purple. Also dignified in the deep, rich color with the silhouette stamp. I like how you used Orchid Opulence, which I still love. Very nice trio of cards. If you find it in the dryer, use it on a card! A CASE for the Mr. & Mrs.